Vork is intuitive & easy to use and does not have the overhead or performance-penalty that is typical of PHP frameworks. Since Vork removes the undesirable qualities that accompany average frameworks, we felt that it is a framework that cuts away all the negative framework qualities leaving only the benefits and so we split the word "framework" straight through the letter "W" leaving just "Vork". Founded in 2010, Vork is the managing organization of the Vork Enterprise Framework for PHP; headquartered in New York, NY with worldwide distribution. Vork distributes its software and services directly and through a network of certified value-added-resellers (VAR's) throughout the world. Vork provides high-quality, affordable services to its customers including maintenance, support, training, consulting and project delivery. Vork customers include financial service organizations, universities, media, healthcare, telecommunication and advanced technology companies throughout the world. What is the Vork Enterprise Framework? To state it simply, Vork is the PHP framework that delivers the greatest IT ROI. Vork provides a maximum-performance platform that is optimized for scaling to serve enormous traffic with minimal server resources. Vork is the easiest to learn and most-intuitive to use and develop on of any PHP framework available today, thus maximizing development pace and ROI from your human-resources. We greatly appreciate Vork feedback; please let use know your opinion! Why do developers choose Vork? Vork provides the platform along with all of the tools and architecture needed to build feature-rich high-performance scalable apps and is exceptionally-easy to learn and use, and thus will substantially accelerate your pace of development. Why do IT decision makers choose Vork? Vork will maximize your IT ROI, is fully-compliant with every applicable web standard, universally-compatible (can even run components from other frameworks) and greatly simplifies maintenance by using an intuitive standardized project layout. The IT-industry is infamous for projects running beyond deadlines; Vork saves enormous amounts of time and resources and thus enables your team to complete projects in record-time and usually ahead of schedule! 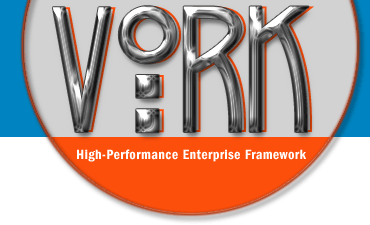 The Vork Enterprise Framework is free (open-source GPLv3 license), so try it now! You have only to gain! Who is backing us? What are your operational logistics? We were originally funded by a "friends & family" round and are now profitable and self-sustaining with several key folks here in New York City plus many consultants and Vork community members distributed worldwide. We have assembled a senior team around the leadership of master-technologist Eric David Benari and serial entrepreneur Ron Guida. Ron Guida, CEO, is a serial entrepreneur who has helped launch and grow many software and services companies such as Covalent, Bluestone, u1.net, Optaros, ETSec, Artezio and Zircon. Eric David Benari, Chairman & CTO, is a master-technologist and IT business expert who has founded and/or built the infrastructure for a large portfolio of ventures spanning sectors of social networks, e-commerce, ad networks, B2B, e-learning, mobile and many others. Michael Dunn, CTO of Hearst Interactive Media, Founding-CTO of Dell Online, former CTO of Time Warner He is responsible for enterprise technology leadership, technical due diligence of strategic investments and providing technical insight on emerging technologies to Hearst businesses and portfolio companies. He was previously CTO of Encoda Systems, Time Warner, Dell Online and held technology leadership roles at True North Communications, Turner Broadcasting, Hanna-Barbera Studios and Americast. He is on the advisory boards of Brightcove, Gomez, Mochila & EMC. Mitch Pirtle, CTO of Sounday, Co-Founder of Joomla!, former CTO & Co-Founder of Gilt Groupe Jetsetter Mitch has an expertise in starting technology companies, building things, learning and teaching. Scale, simplicity and speed are his game. Mitch is CTO at Sounday Music, founder of Joomla! & Spacemonkey Labs, Contributor to MongoDB as well as a web developer, author, speaker and a technology "enabler". Mitch has held roles at Apple Computer, Sun Microsystems, MTV, Totsy, 10gen (MongoDB), KickApps and other exceptional organizations. Cal Evans, CMO of Blue Parabola, former Editor-in-Chief & Community Manager at Zend, former Director of iBuildings PHP Centre of Expertise Cal has spent the last half of his multi-decade career focused on helping make the lives of developers better. Whether that is building great teams, preaching about telecommuting, how to improve developer productivity or just helping connect developers with great companies, Cal loves helping developers. Having been a developer, and more importantly having worked under bad bosses and great bosses, he knows what it takes to make developers happy. Happy developers are productive developers; productive developers work at successful companies.